The Russian artist-painter, born January 7, 1956.At a present stage of a creative way of the artist the painting close to impressionism dominates. Color scale constructed on soft combinations of ochre and light-blue, invoice of touch, have created an original picturesque style which absorbs a great experience of creative work in the field of art and applied art. The craving for impressionism, for expression of light-airy atmosphere, enveloping, washing away precise contours of buildings and human figures, is usual for both early paintings .In his creative work the artist heads for traditions of classical realistic school of painting, striving for the following, to convey in his creative work his personal emotional attitude to the chosen theme.The romantic character is typical for chamber still-lifes of the artist in which she introduces new picturesque qualities directly connected to nature. 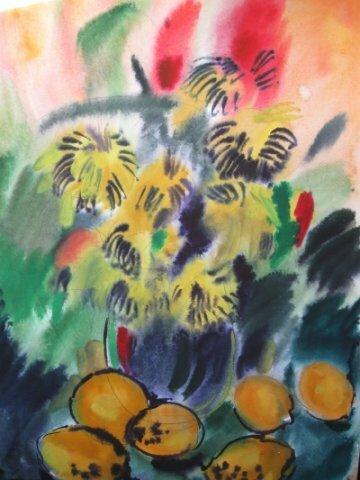 Blossoming sunflowers, charming irises (“Still-life“), are painted with a remarkable improvisation freedom easily and natural.In urban landscapes by Olga the synthesis of all gentle and sad, that is connected with Russia seems to be found. It is not only a poem about Russia , but also deep and concentrated thoughts about it, expressed in a transparency of silvery air and beauty of ancient houses.Olga Okaeva is the foreman of elements of color. To what motive she would not address, there is her constant admiration of natural riches of colors, gentle colors. She passes sensation of a spontaneity of real impression in all genres of painting. Until she was in her early 20s, artist had never considered a career in art.“I grew up in a very formal european family where we were pushed to excel in academics, languages, art and music, but I prefer art class, ”she says.After studying at the University and earning a master’s degree in Fine Art, she taught Art, German, academic interdisciplinary study in Cultural Theory&Visual Arts Teaching Methods, did Managing activities in the Department of Culture and always a full-time artiste. Her works are in exhibitions and private collections worldwide.